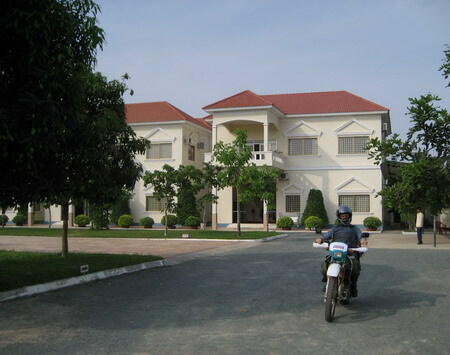 It is around 8pm when we reach the Samrong Sen Hotel in Kampong Chhnang, after a 2 hour night ride from Phnom Penh. This hotel, which is recommended, is located on the ride hand side of the road to the port, a few hundred meters after you pass the market. 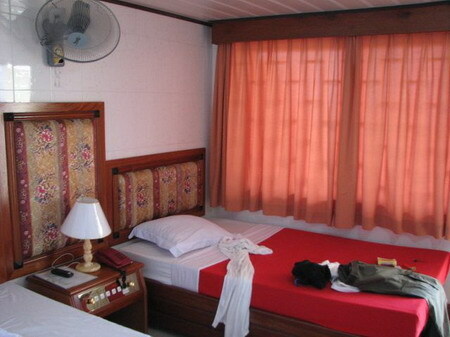 For $8 we get very decent rooms with fan and TV in this new and well-run hotel. 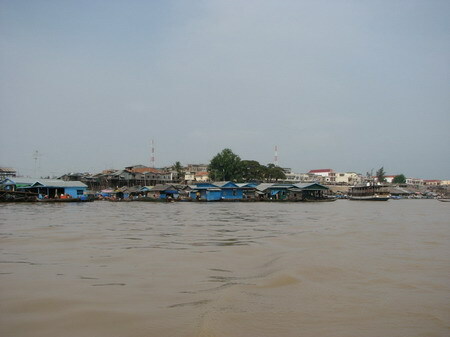 Later we talk to hotel staff, to find out about the ferry schedule to Kampong Leaeng, a town on an island opposite Kampong Chhnang town that we will have to pass on our way to Kampong Thom. However, the guys tell us that this trip is not possible and that they have not heard of people who did it. We keep talking and later go with one of them on the bike to the port, to ask people around there. We stop in front of the police station and talk to the officers. More people join during the course of a rather confusing discussion. 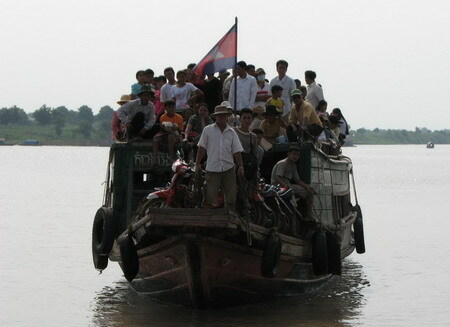 At first people tell us again that it is not possible to get to Kampong Thom this way. 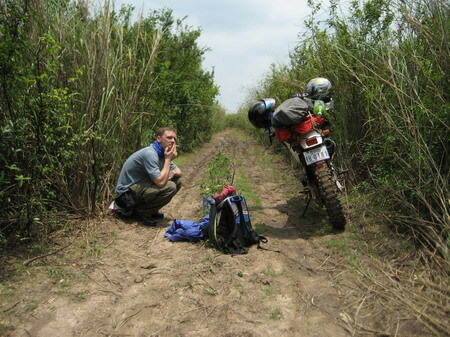 Even attempting this trip is dangerous and â€˜crazyâ€™, because there are bandits and robbers out there. The officers accompany this piece of information with raising their hands to their heads like guns and pulling virtual triggers. 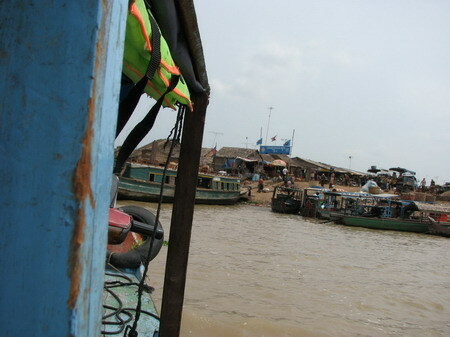 They also tell us that the ferry to Kampong Leaeng is not operating tomorrow, due to Khmer New Year. 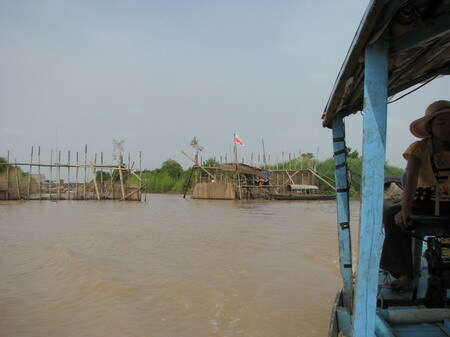 When we ask for private boats they say, at first, that boats cannot land on the island because there is not enough water and because there is too much forest. Later other people say that we can find a private boat but that it is very expensive. 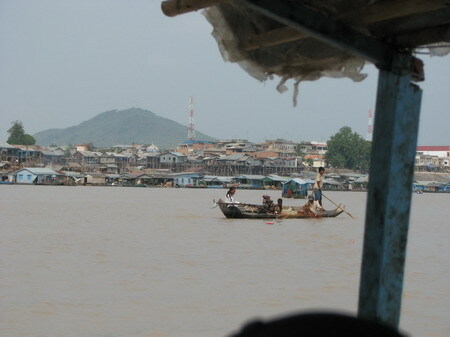 If we really want to cross the Tonle Sap, we should ride back either to the Japanese bridge in Phnom Penh or the ferry near Udong Mountain. It seems to emerge from the discussion that the best option for us is to take a private boat for $50 to cover the 40km stretch from here to Prey Kri and to continue from there to National Road 6 by bike. This option is not nearly as attractive as our initial plan as it does not get us very deep into the flood plains and would mean that we end up doing much of the trip on the national road. We are still not convinced that our original plan is not feasible but decide to wait with decisions until after we have talk to the people actually operating the boats in the morning. So we turn around and have a good diner in the Monorom Restaurant about 5 km to the West along the National Road, the only place that still serves food at this late time of the day. 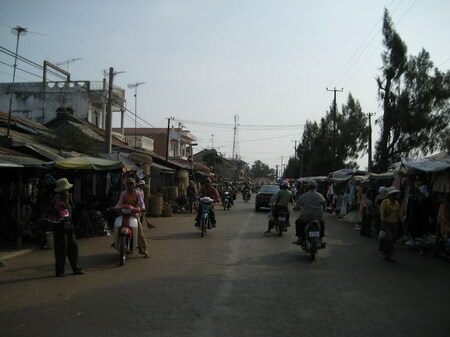 Next morning we get up around 7, have breakfast in the Mekong Restaurant at the national road, fill up the tank and some extra 3.5 liter gas in plastic bottles, check out, pack our stuff on the bike and ride to the port again. 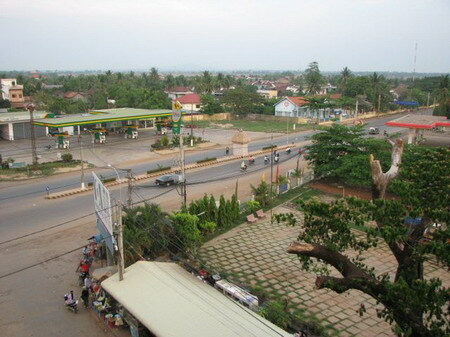 Kampong Chhnang town in the morning. Leaving the Samrong Sen Hotel in the morning. On the way to the port. We find the port rather busy. 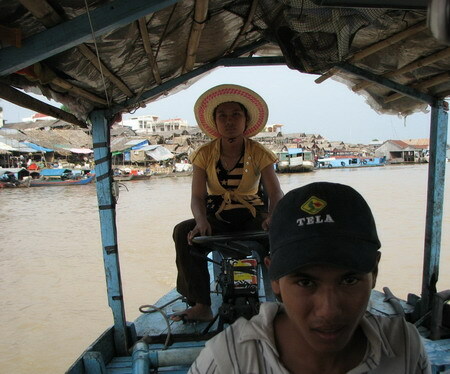 We ride down to the place were the ferry usually launches, right at the center of the water front. Many people are waiting for boats, many of them dressed for visiting family and friends over the holidays. Again we are getting contradicting advice. 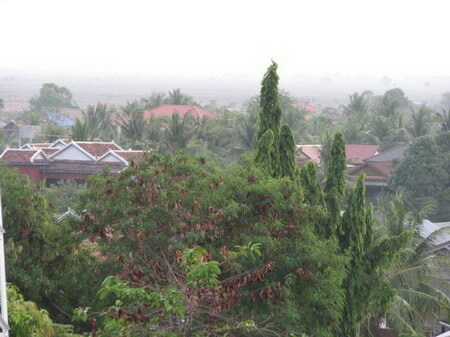 Yet nobody can confirm the possibility of going from here to Kampong Thom. 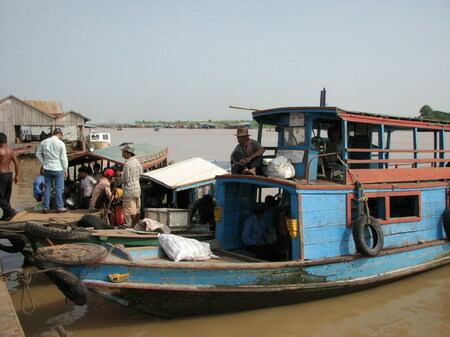 People tell us that the big ferry to Kampong Leaeng is operating but will leave only at 1 pm. Smaller and bigger boats come and go but seemingly none of them with our destination and/or not willing to take our bike on board. 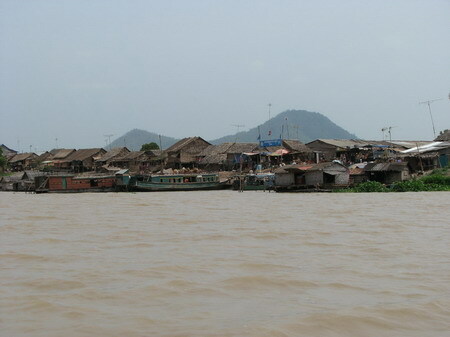 During the rainy season, those houses are standing in the water. 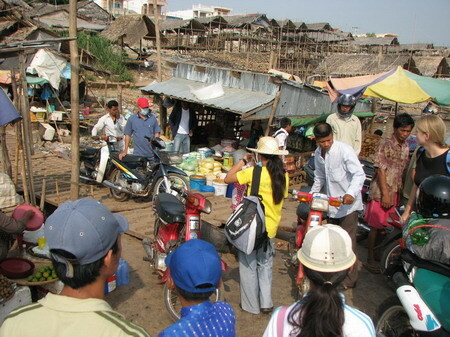 Maraile talks to moto drivers at the riverside and Cham, one of them, takes her to the Vietnamese owner of a small private boat. 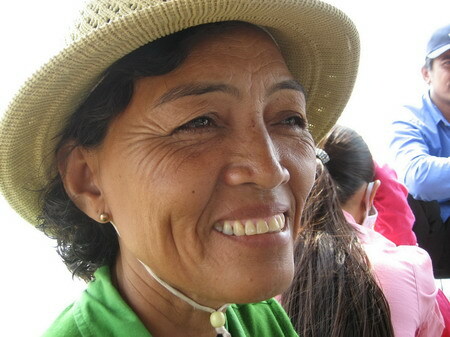 She is willing to give us a ride to Kampong Leaeng for $10. 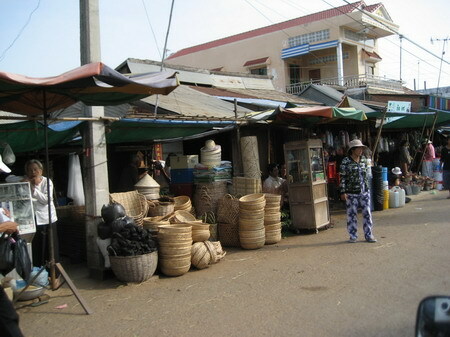 The quoted price seems quite high but we accept as it is Khmer New Year and we donâ€™t want to give up on this adventure. Our attempts to get Cham and his family a free ride to Kampong Leang fails as the boat owner insists that they pay extra. It takes a few minutes (and a little fear on my part) until our moto is safely on the boat. 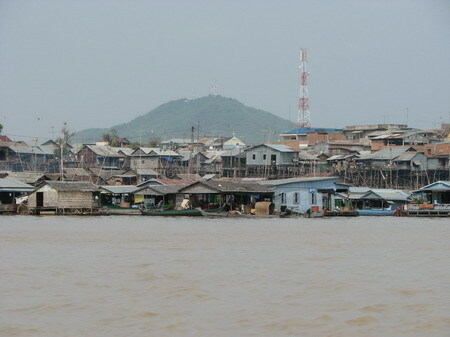 We reach Kampong Leaeng about 20 minutes later, after a scenic boat ride on the Tonle Sap river. We talk to our fellow passengers during the ride. Cham is a teacher at a local high school. He was trained for teaching mathematics and physics but now teaches English, due to high demand and little availability of suitable teachers. 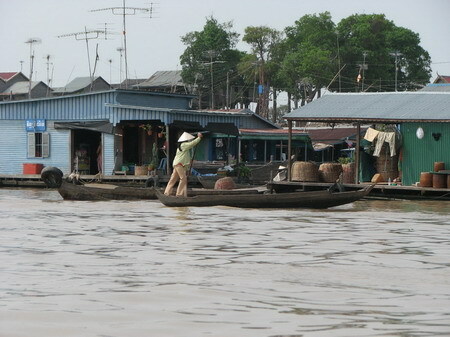 He is on his way to visit his wifeâ€™s parents in a village on the island. 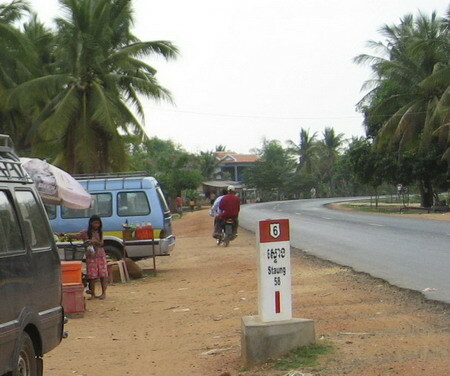 Cham tells us that it is only about 10 minutes from the ferry landing point to Kampong Leaeng village where one reaches a dirt road that leads in a loop all around the island (consistent with the map). This road is in good condition and it takes about 1 hour to make the loop by moto bike. 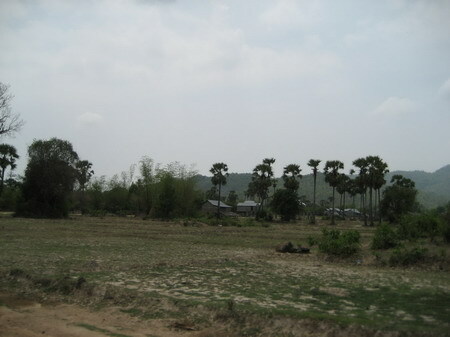 Also Cham did not know that it was possible to go directly from here to Kampong Thom but unlike everybody else so far he encourages us to try. 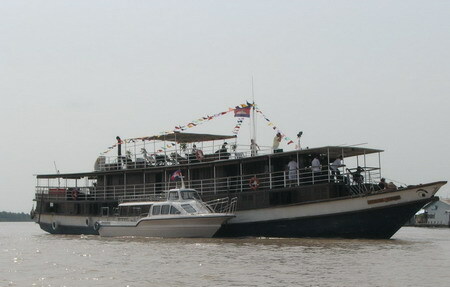 Rich people on a luxury cruise of the Tonle Sap. 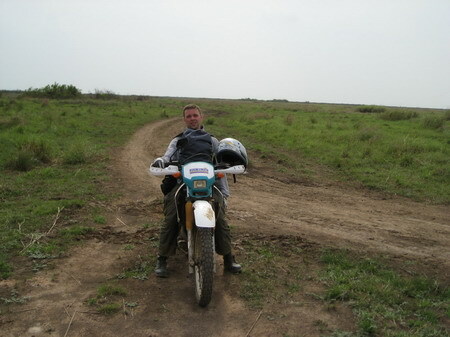 After we have cleared the bike from the boat we follow the dirt road through pleasant rural landscape. 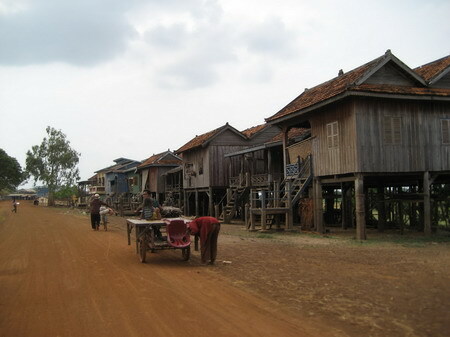 After 20 minutes we stop in a village. One boy among a bunch of youngsters we ask for the way offers to guide us to the ring road. It turns out that it is hard to miss. 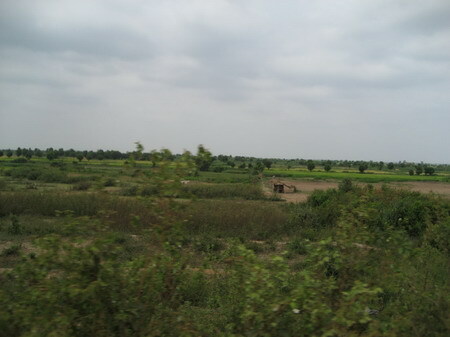 The road is in good condition and leads through beautiful countryside and a few villages along the way. 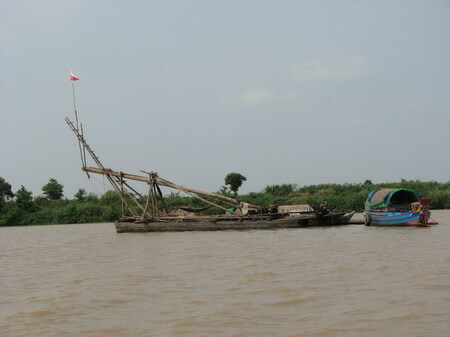 There are boats of various sizes sitting on the ground. The soil is very dry and right now this area appears an unlikely spot for boats. We also pass a number of hills. Some of them have Chenla-times temple ruins on top of them but we decide to continue and make getting to Kampong Thom our priority for today. 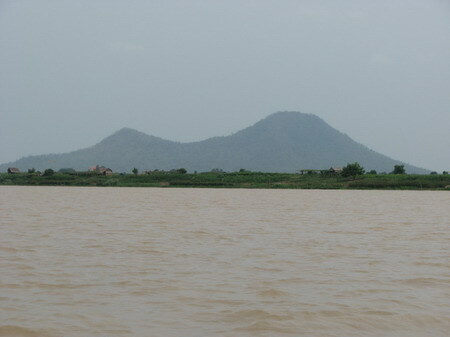 Macâ€™s report and the map suggest that the trail to Kampong Thom departs from this ring road at the northern tip of the island and next to a temple. On the island circle route. We stop in a village when we think we are close to the northern tip of the island. The response of a group of young women we ask for the way indicates that we should go back just about hundred meters where we can see a gate indicating the location of a pagoda. We stop at a food stall next to the gate for soft drinks, hoping to get people to tell us how to find the way to Kampong Thom. 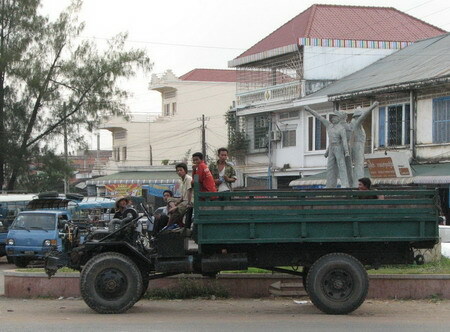 A group of about 8 middle aged men sit inside and appear pretty drunk while a dozen younger villagers are standing around. We approach the older men first but they are too drunk to be helpful. 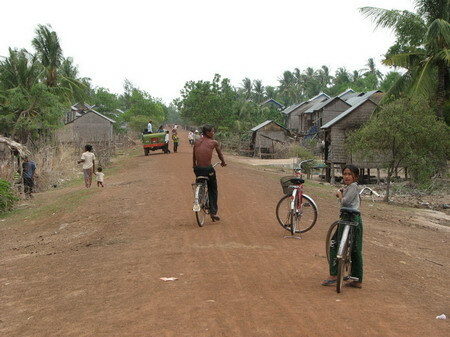 But even the sober younger men and women we ask outside say that it is impossible to go from here to Kampong Thom. We spend about 20 minutes but people insist. Yet they do seem to be saying that if one wanted to try, the way started here at the temple. 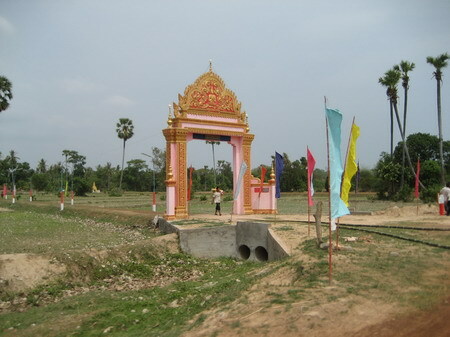 The trail to Kampong Thom starts behind the temple at this gate. Despite all the discouraging advice we decide to give it a try, now that it is still early in the day and that we made it here already. After we pass the temple the trail branches of into half a dozen trails leading through a small cluster of simple houses. We ask one or two people for the way and they point us to a trail that leads towards a hill after we have passed the village. Right at the bottom of this hill the track turns right. 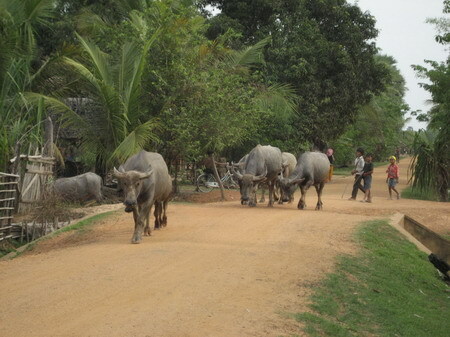 For the next hour or so we follow what looks like a narrow and not very frequently used ox cart trail. 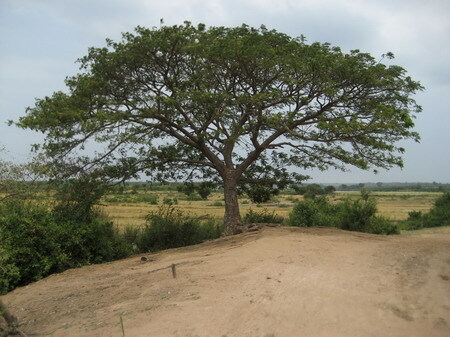 It is dry and bumpy and in places has deep and hard prints from left by oxcarts. The kind of prints that make it hard to avoid getting stuck in them with the front wheel. To the right and left are reeds, tall as men, making it impossible to see what is beyond them virtually all along the way. We stop for a short break after about one hour. It is already getting pretty hot and we realize how painful it is going to be that there is no shade for virtually all along our way today. We continue for another 30 minutes or so until we reach a fork in the road. 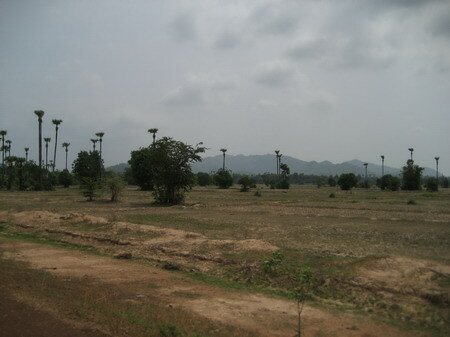 Since we have left the village we have not come across anybody. 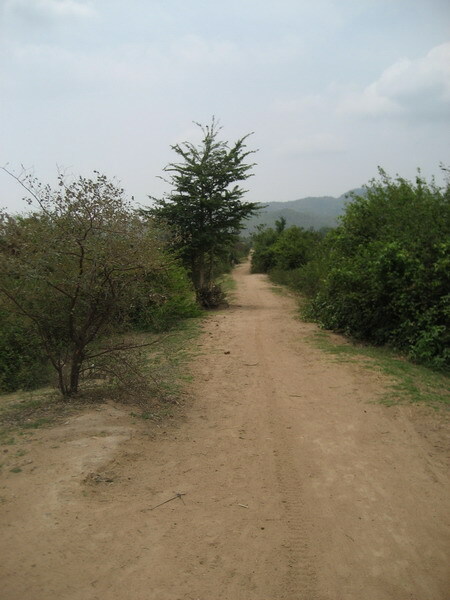 However, until here the way has been very unambiguous and it is easy to identify the widest and most frequently used trail on the few occasions were there is more than one way to follow. Also here it seems obvious that the â€˜main roadâ€™ turns right but we check out the alternative, just to be sure. 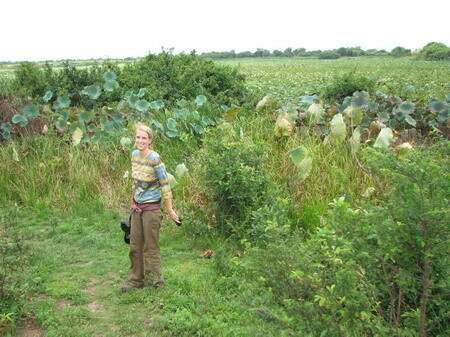 After only a few meters the road ends at some sort of lake, or pond, or lotus flower field. There are people working in this field but too far away from us to ask them for the way. Since this trail (the left one in the photo above) obviously leads to a dead end there does not seem to be much to ask about anyways. At a closer look it seems the guys in the field are applying chemicals from large containers they carry on their backs. Now we take a right turn at the above fork and follow the trail for another couple of minutes and there is at least one more track branching of to the left until we reach another lake. There is a guy bathing in the water. 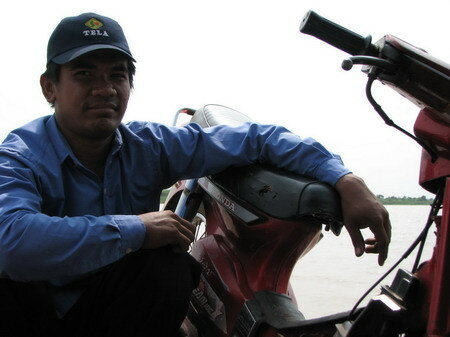 He does not look very friendly at first but starts smiling when Maraile talks to him in Khmer. 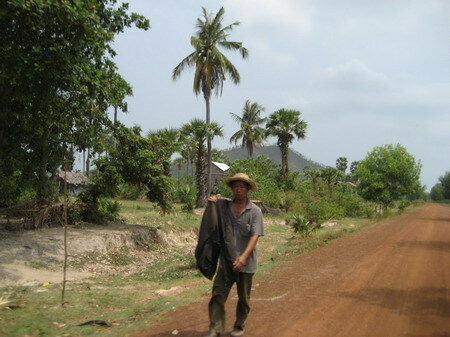 He tells us that the track from here to Kampong Thom is better than the one to Kampong Chhnang. 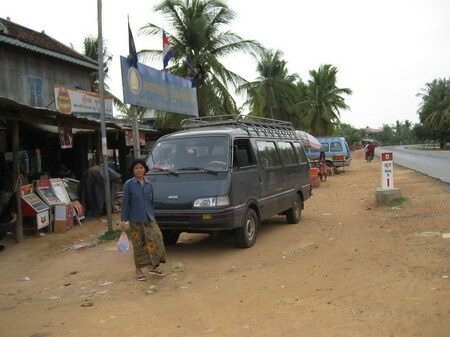 He also tells us that it is only about 20 km or about 1 hour from here to Kampong Thom. 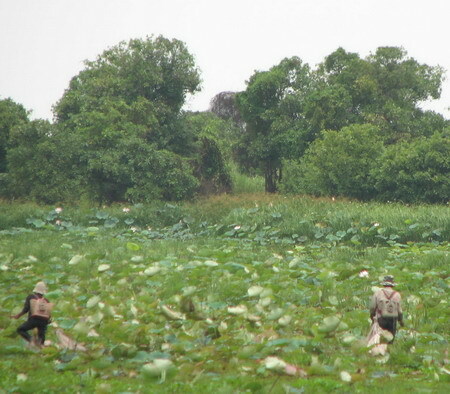 We just have to backtrack a short distance and follow a track to the right hand (or the left from Kampong Chhnang) at an intersection between here and the first lotus field. Happily we do as we are told. However, the trail we get on just 10 minutes later seems to have seen substantial rain lately and has long stretches where the track is filled with mud and water. We keep following this track. There are easier and tougher stretches but overall, this trail is definitely not better but worse than the one we were riding on before. 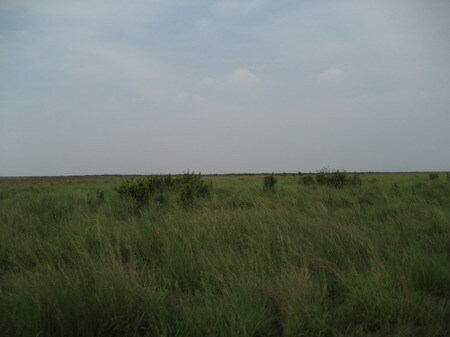 After about on more hour the high reefs along the track disappear and we enter plains with only short but green grass and a few bushes. The view over the plains is wide open, occasionally we see exotic-looking birds, large and small. The trail is pretty good around here and we can ride faster. There are a couple of tracks, sometimes crossing each other or running in parallel. 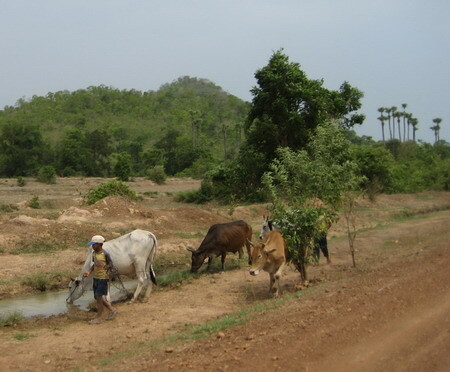 After about 30 minutes we have passed the plains and find ourselves again on a muddy track between tall reefs and with little view other than the sight of a few dozen meters of ox cart trail in between thick vegetation. We are in the middle of the day now and it is very hot. 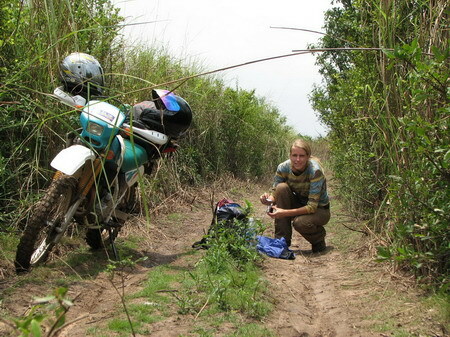 Maraile has to get off the bike frequently to walk particularly bad stretches. After one of those struggles with the mud I feel that the heat is too much to take and want to pause instantly. I try to find cover from the brutally hot sun by squeezing myself under some reeds but find that it does not help at all. It is at this time that we realize that we have lost 1 of 2 bottles of water, the full one, while the other has half a liter or so left. For some time it appears impossible to me that under these circumstances I will be able to cool down enough to be capable of riding to Kampong Thom. At this point I find the police menâ€™s mentioning of robbers out here rather stupid. Who in his right mind would be waiting out here, having his brains fried in the merciless sun, to hold up the few people insane or desperate enough to make this trip, hoping that one day somebody actually carries anything of any value, with very few ways to get away from the crime scene, none of them quick or easy. Increasingly I suspect that we have gotten onto a wrong trail. 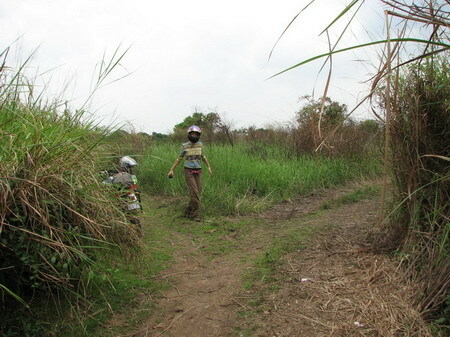 The experience of the last two hours sharply contradicts what the man at the lake told us, namely, 20km good track and 1 hour riding to get to Kampong Thom. We check the compass and find that the track we follow leads to the east, probably already for quite some time, while at this point we should be going pretty straight to the north. And it appears possible that we took a wrong turn while passing through the open plains about 30 minutes ago. 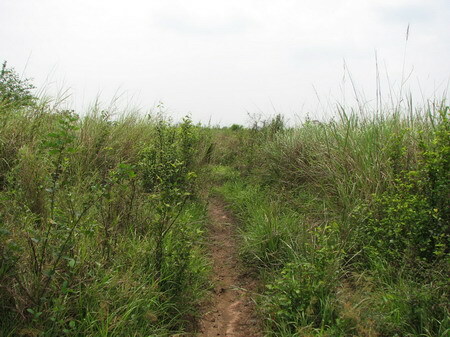 We decide to backtrack and check if there are other trails leading north. 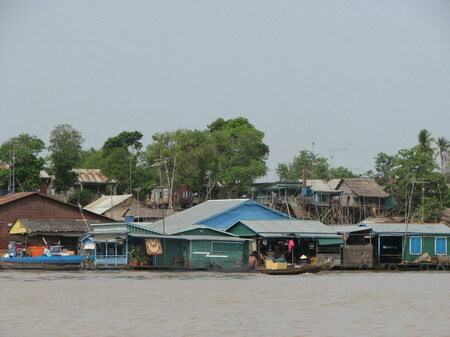 We find one very soon, also leading through thick and tall reefs but it looks too abandoned to be the link to Kampong Thom. 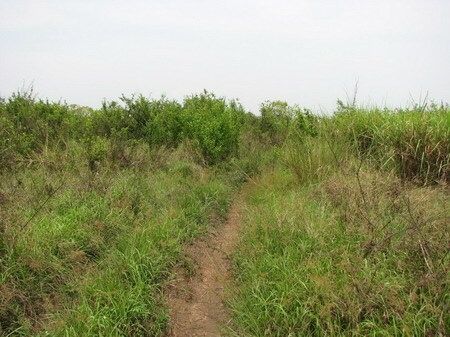 We continue to backtrack and follow some of the other trails in the open plains. However, we find that all of them are basically variations on the same trail, not leading anywhere else. 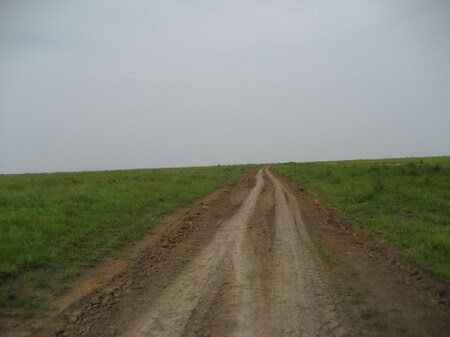 After we have passed the plains again we discuss and decide to turn around again and follow the track we were on. 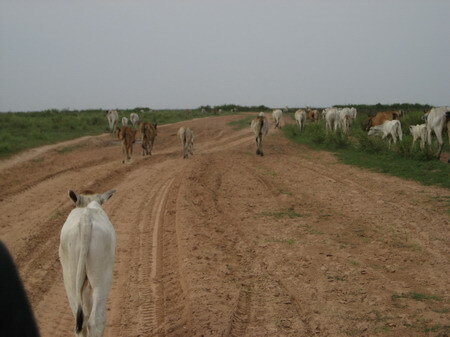 It is possible that we got onto the wrong track after talking to the man in the field. But at this stage we donâ€™t want to ride all the way back there and given a substantial number of tracks around here, this must lead somewhere close to national road 6 sooner or later. We pass the point were we had turned around before and continue for at least another hour on the trail through the reefs, with lots of sun, no shade and plenty of mud on the trail. 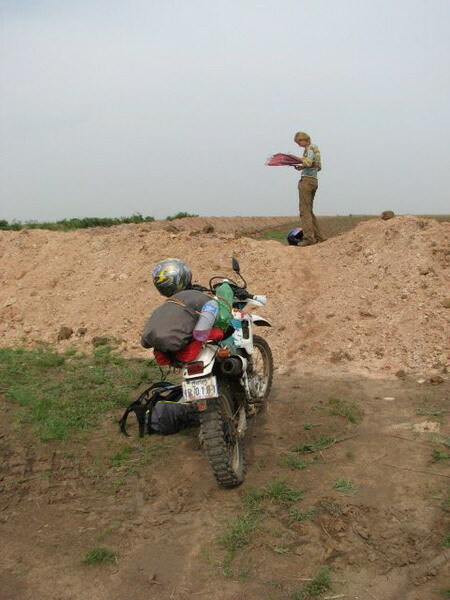 Over time the track widens and the number of different tracks increases, which also makes it easier to avoid the deep mud in some places. After one more hour the landscape is wide open again. By this time we had fallen twice altogether with the bike into the mud. The first fall gets Maraile some bruises and myself slightly burnt skin on the right leg. The second fall breaks one of the mirrors. After we lift the bike it does not start. It does not give a sound although it does not seem that any essential parts broke or have become wet. We start to worry but decide to give the bike some time and try again. The good news is that we check the compass and find that we are traveling north, which from here makes probably for the shortest distance to the national road. Reluctantly we start pushing the bike to start it. We donâ€™t get the engine started the first time but at least the starter is coming back. We try one more time and this time we manage to start the engine. 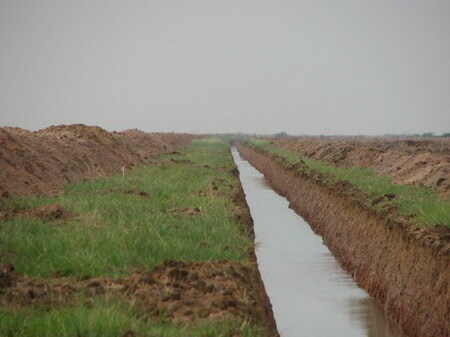 We continue until we arrive at a freshly dug irrigation channel that crosses our way and reaches from one end of the horizon to the other. Afar we can recognize a couple of excavators. These are the first signs of obvious and immediate human activity since we left the village on the island. We have a short break before we continue on the dirt road along the channel to the left (north). We keep going until we follow a neat 90 degree right-turn of both channel and road. Now we see occasionally trees and finally, people and cattle. 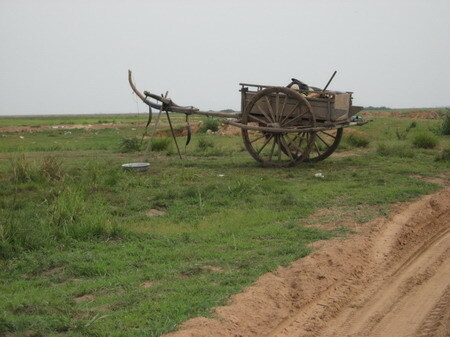 We stop a young couple with a child on one of these modern-day ox carts. 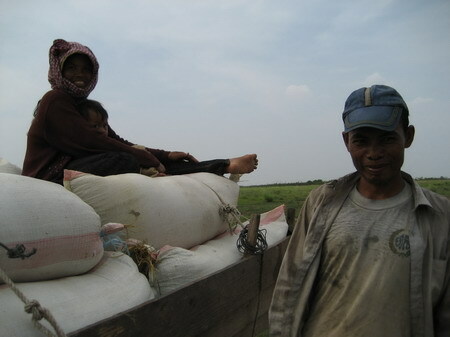 They tell us that they, too, are on a trip from Kampong Chhnang to Kampong Thom. The latter is about 1 hour from here. Now the ground is entirely dry and much of the trail sandy. 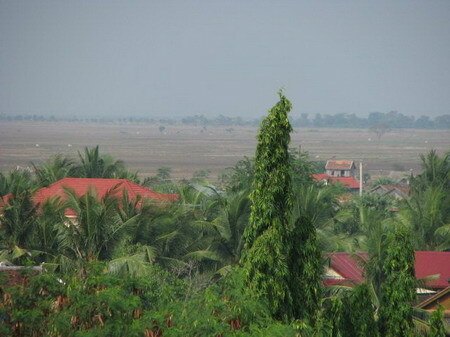 In the distance we recognize hills, groups of trees and finally, houses. 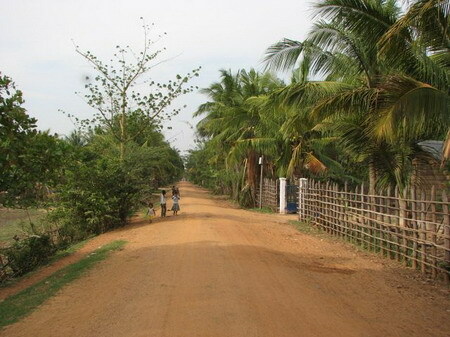 We enter a village with a well-maintained dirt road leading right through it. We follow the road and stop at the first sign of beverages for sale. We stop and buy a coke each from the friendly vendors. 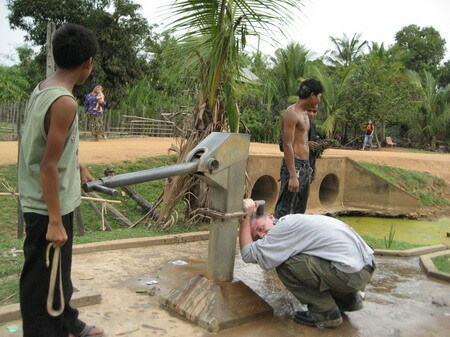 There is a well with a hand-operated pump nearby and a couple of young men having a bath. We use the opportunity for refreshment, too. Then we just sit for a while with the drink vendors and some locals, talk and play with their kid. Oddly, the guy on the left holds a dead snake in his hand. 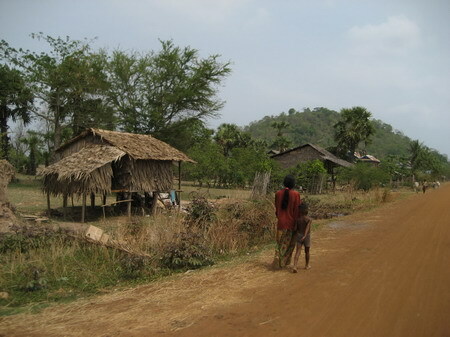 People tell us that the main road is just 5 minutes from here and from there it is only 5km to Kampong Thom. We leave and ride the little remaining distance to the Arunras Hotel, where we have a reservation for these smart rooms with balcony on the top floor. 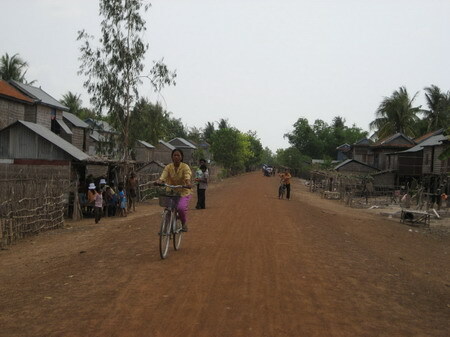 The last kilometers to Kampong Thom. 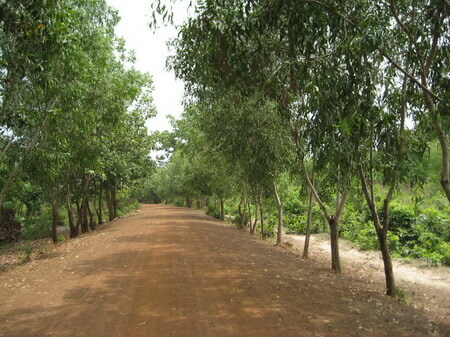 We are coming on this dirt road and it is here where it meets the national road, pretty accurately 5km south of Kampong Thom. 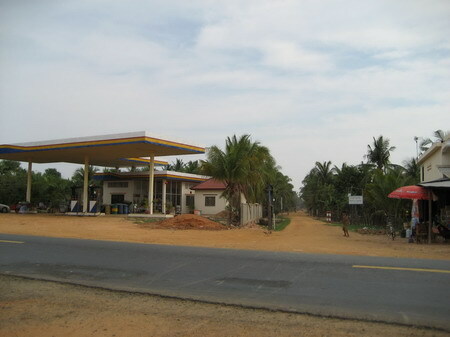 This sign reads â€œ6â€� (like in national road 6) and, below, â€œStaung 85â€�. After some rest and a shower we meet Vothear, my long time friend and guide in Kampong Thom, for diner. He is getting married next weekend. During our discussion it emerges that Maraile will return to Phnom Penh tomorrow morning, while Vothear and I proceed to Stung Treng, via Preah Vihear Province. 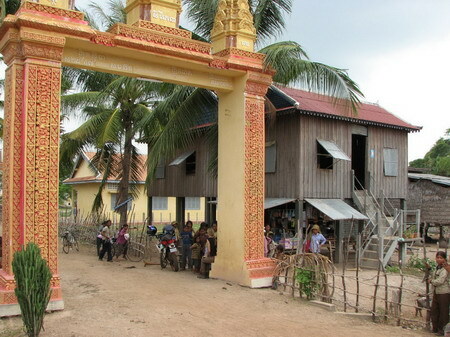 First, I felt worried about the resumption from the temple’s gate in Kampong Chnang that you might lost your way and got in a dangerous area. 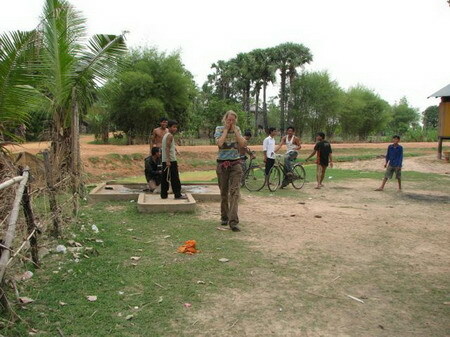 We are glad that you are having good time in Cambodia. We are from the Ministry of Foreign Affairs & International Cooperation, and would like to share with your about e-Visa, where Visa to Cambodia could be applied online without visiting the embassy. We would like to share with you our recent collaboration with Travelfish where you could get a complimentary eGuide when apply for your travel Visa online. In conjunction with this, we would like to send a copy of the eGuide to your email, and hopefully you could share with us whether the eGuide was helpful? Apologies for my late response. I would be delighted if you could sent me your eGuide and will gladly share my comments with you. Hello from Spain!! This is a great blog. 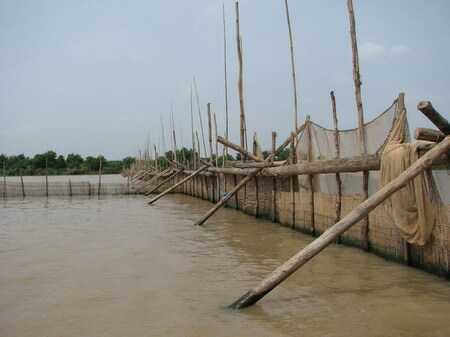 You have discovered many things of Cambodia that i didn’t know. Thank you for this and keep in that way!!! Hello from Japan! Perhaps I was as glad to see the National Road 6 marker as you were at the time. Probably not though ðŸ™‚ I’ve actually been looking quite a while for a picture of such a marker so I have a better idea of the shape around the number. This will greatly help my ongoing project to locate, research, travel to and photograph the world’s roads named “42,” found on my webpage linked above. I suspect Cambodia’s 42 is unmarked, since different maps put it in different places. It branches off Road 4 from somewhere, though. Anyhow, I’ve enjoyed reading of your adventures so far! 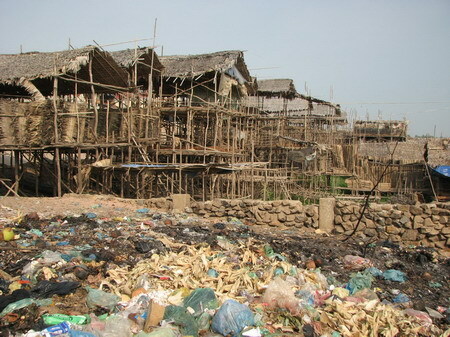 Hiâ€¦ I came across your blog while searching for Cambodia information. I plan to go to Cambodia next month but Iâ€™m confused about the currency. I heard they use both USD and riel. Is that true? And I came across a site which we can apply visa online http://evisa.mfaic.gov.kh/ I wonder it is secure and reliable? Please guide.. Thanks..
Wow, such a wonderful experience. I hope join you in one of such trip. Many thanks for your kind words. It gave me a shiver to read that this track was your escape route. I am glad you made it! Hope to meet in person one day, probably in Cambodia. Ha ha i love that pic of you “exhausted”. Those long days of off-road biking really take it out of ya. Beautiful photos with a long post! 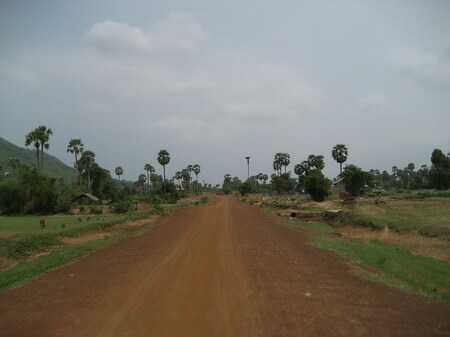 Those muddy road remind me the trip to Koh Kong. For German citizen, you may find this page useful. It has visa requirement for German to Asia.